Modest Mama: Vote for Me!!! I have been nominated for a homeschooling award. 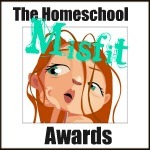 Let me verify, it is a homeschooling misfit award. Oh the joy! I am totally excited and would love for you to vote for me. There are prizes involved, woo-whoo! In order to vote for me (there are prizes! WOOO-WHOOO!!! ), please click this link for the Not So Superwoman blog, and scroll down to number seven. There I am under The Meme Forgotten Award. At the bottom of the post is the link to vote. I would love to get more than one vote~ the one I give myself. Please consider voting for me. Prizes! Woo-whoo!